I’m certain I’ve now exhausted my lifetime allocation of good fortune. Yesterday my wonderful agent, Beverley Slopen, confirmed that McClelland & Stewart will publish TBLP as one of its fall releases. M&S is the heavyweight Canadian publishing house with a long and rich history. What’s more, Douglas Gibson, yes the Douglas Gibson, will not only work with me on the manuscript, but the novel will actually be published under his prestigious imprint, Douglas Gibson Books. To me, this outcome is kind of like aiming to win the high school track meet, but instead ending up going to the Olympic Games and bringing home a gold medal. Doug is probably the most respected editor/publisher in the country having worked closely with some of Canada’s and the world’s leading literary lights including Robertson Davies, Alice Munro, and W.O. Mitchell to name but a few. I am over the moon. As the Globe and Mail article below mentions, there is some irony in this most welcome outcome. Doug and I are actually friends, because our respective wives are close friends. I’ve so enjoyed the times the four of us have spent together. When you’re a passionate reader and weekend writer, nothing is more enjoyable than listening to Doug’s wonderful stories from his illustrious publishing career. It was a discussion with Doug three or four years ago about three-time Leacock Medal winner Donald Jack that ultimately got me off the couch and writing TBLP. Until last week, I’d never really spoken to Doug about my novel. I can only imagine how often he is accosted at parties or conferences by writers hoping that he’ll review their manuscripts. So I chose not to talk about my writing with Doug so as not to complicate the wonderful relationship we have. But after the Leacock Medal, Beverley Slopen did make an approach and the publishing deal was consummated yesterday. I could not be happier and I’m so looking forward to working with Doug. I am going to stop posting media coverage.Â It does seem kind of self-congratulatory but I love this headline so much.Â It’s pithy, to the point, and oh so accurate.Â This story appeared on the front page of the wonderful Orillia Packet & Times on Thursday, May 1st, the day after the Leacock luncheon. 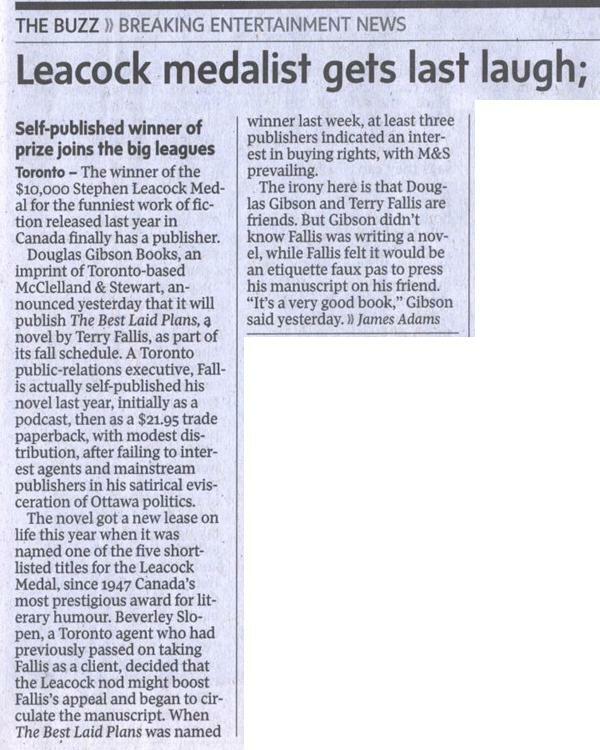 There is not nearly enough distance from the Leacock ceremony for me to offer any kind of perspective on what winning the Leacock Medal for Humour means or will mean to my life as a “writer.” I think I can say with certainty that life after the Leacock will, almost by necessity, be different. In a way, I am already different in my own eyes and likely in the eyes of others. The shock of winning is compounded by the fact that I really had little sense of whether I had written anything worth reading. I was far too close to it to have any literary objectivity. Here’s a passage from my very first post on this blog when I was about to record and publish the very first episode of the TBLP podcast. At this point in January 2007, my manuscript had not yet been submitted to iUniverse to start its long journey to print. Here’s a quick shot of my favourite clipping from the last week. It ran in the Orillia Packet & Times the day after the Leacock announcement. The headline says it all. I would only add that quickly on the heels of shock, came an almost overpowering sense of gratitude. My life as a writer, such as it is, has been irrevocably altered by this wonderful medal that carries with it such history and prestige. I am immensely grateful. The power of a little media coverage. On a lark, I checked iTunes this morning and was shocked (for the second time this week) to find the TBLP podcast sitting at the number one spot (Arts and Literature). Certainly a Leacock halo effect. I grabbed a screen shot as I don’t imagine it will stay at these lofty heights for long. Bizarre to be ahead of the New York Times Book Review podcast, which is one of my “must listen” podcasts. Just another surreal aspect to a surreal week. Sometimes big things come in little packages. Such is the case with the Stephen Leacock Associates. On Wednesday, this small group of hard-working, dedicated volunteers brought national attention to Orillia in announcing the 2008 Leacock Medal For Humour award winner. The news, coming from Swanmore Hall right here in Orillia, was picked up across the country. 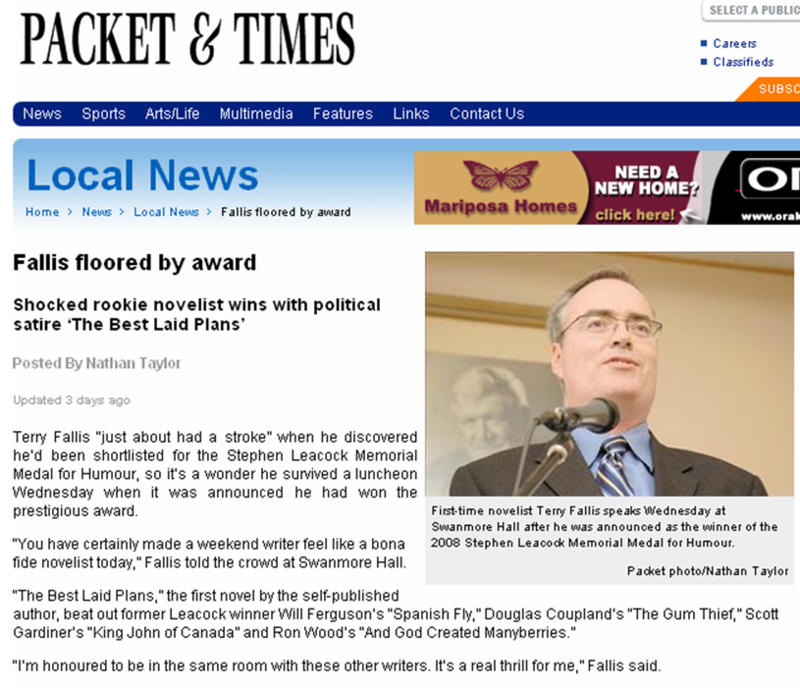 Terry Fallis, author of The Best Laid Plans, was named the winner of this year’s medal. That was an important moment for the Orillia group as well, in that it underlines the impact the medal has on the publishing world. 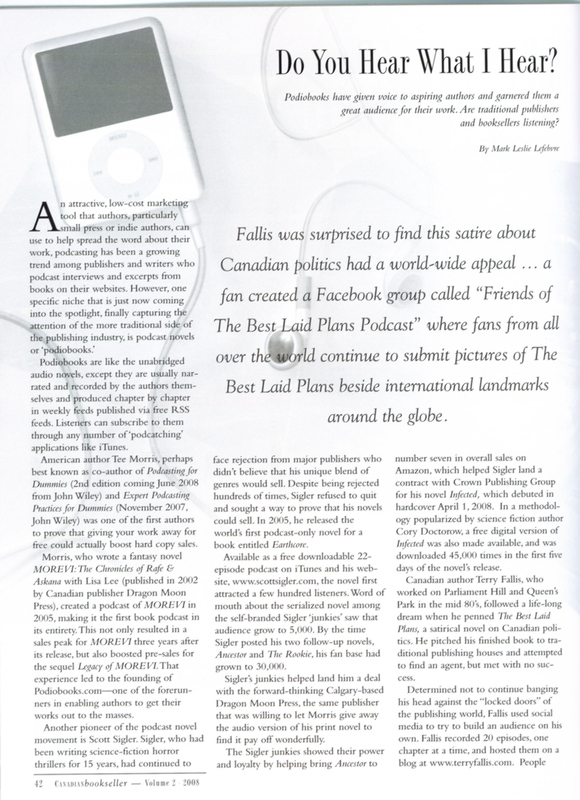 The publishers of best-selling authors like Will Ferguson and Douglas Coupland rush to have the Leacock Associates seal placed on book jackets as soon as the five finalists are announced, and the stamp of the medal of humour on any cover is a major help in promoting and selling a book. 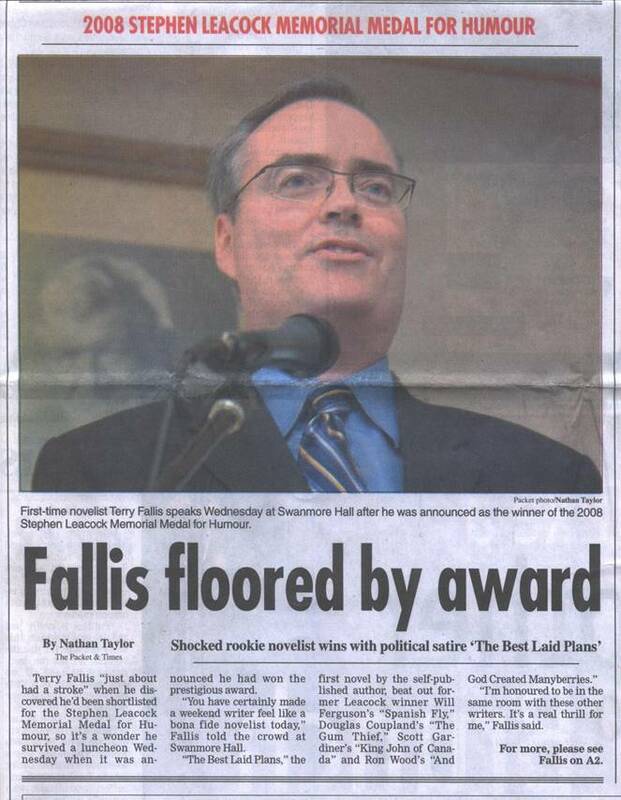 But the story of Terry Fallis may best illustrate the authority of the medal. His offering was self-published. 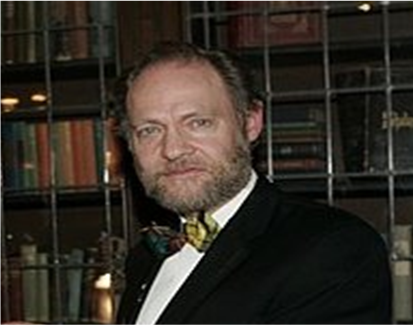 When his book was named among the top five in Canadian humour for 2008, he almost immediately began to hear from agents and publishers. Winning this medal could well launch another bright light in Canadian letters. Not bad for a little place like Orillia. Anchored by the wisdom of people like Pete McGarvey in preserving and promoting the Leacock home as a museum, and upheld by the ongoing strong performance of the museum under current curator Fred Addis, the Leacock legacy is alive and well in this city. Most of the credit for that goes to people like those who work away in relative anonymity to care for and build upon one of the truly great stories of this community. Kind of makes me want to move to the wonderful and picturesque town of Orillia, home of Stephen Leacock.